Interview: Tony Robinson – In the last of his two-part interview, Mike Jiggle speaks with the former BRP mechanic about his transition to designer, both for BRP and later Cooper. 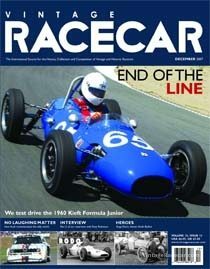 Profile: End of the Line – Casey Annis test drives the last racecar to bear the Kieft name-the 1960 Kieft Formula Junior. 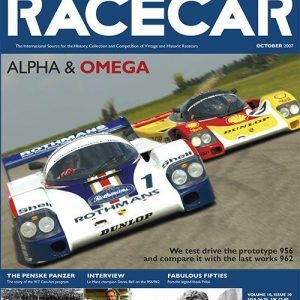 Feature: No Laughing Matter – Robert Newman reveals that when Audi debuted their four-wheel-drive Quattro rally car, the opposition laughed. However, their laughter soon turned to tears when Audi revolutionized the sport. Fast Lines: My Sister’s MG – Pete Lyons examines the impact of the MG, while he looks back at the one that got away. Heroes: Andre Boillot – Robert Newman examines the career of the French driver that, despite winning the Targa Florio, always lived in his brother Georges’ shadow. 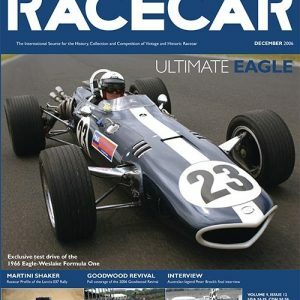 Legends Speak: How to Get a Formula One Ride – Dunlop Tire impressario Phil Lamont looks back on how he helped finagle a Lotus 49 drive for fellow Canadian Bill Brack. Art History: “Gold GT40” – Artist Chris Dugan paints a study of the GT40 that finished 3rd in the 1966 24 Hours of Le Mans. Hot Laps: Winton, Penrite-to-Kitome – Skip Barber instructor Mikel Miller shows us the fast way around Australia’s Winton Raceway. Fabulous Fifties: Photo Archives – Art Evans shares some of the resources he uses to locate those hard-to-find photographs. 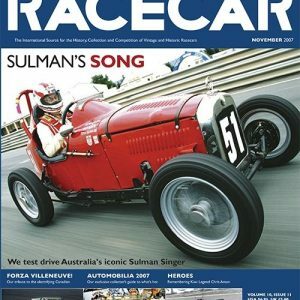 Greatest Racecars: Alfa Romeo P3 – British sports car legend David Piper registers his pick for the greatest racecar. 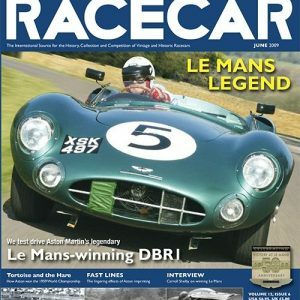 Last Lap: The Crystal Ball – Mike Lawrence reveals that-if history is any indication-you really can’t predict a Formula One driver’s success on his previous performances.